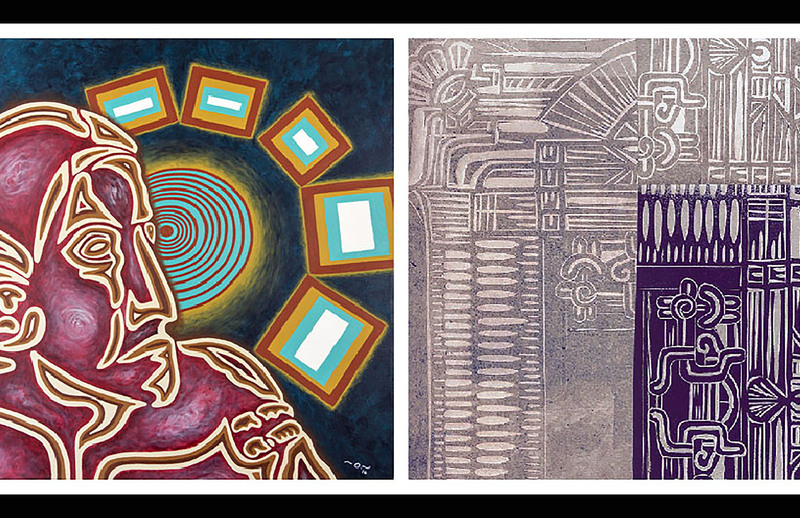 The work of two artists born in Mexico is being celebrated at the Gallery at Chandler Center for the Arts in honor of National Hispanic Heritage Month. “Ida y Vuelta: There and Back,” an exhibition featuring prints from Diana Calderon and photographs and paintings created by Oliverio Balcells, will be on display through Oct. 6 at the gallery, 250 N. Arizona Ave.
A public reception for the artists will take place from 6 to 8:30 p.m. on Sept. 8, also at the gallery. National Hispanic Heritage Month, from Sept. 15 to Oct. 15, brings awareness of the contributions of Hispanic and Latino Americans to the United States and celebrates their culture and heritage. “It’s a mix, integration of the images and the colors, the mix of the many cultures that we have in Mexico,” he said. “I’m from Guadalajara, Jalisco, so I used to paint a lot of agaves. Balcells moved to the United States in 2000, first to Mesa and then to Tempe. He is heavily involved with arts in the City of Tempe. Balcells was previously chosen by the City of Tempe’s Public Art Program to paint and design a utility box on Mill Avenue. That image was then converted into a library card for the Tempe Public Library. Balcells also created a garden mural with Free Arts of Arizona and he was a chosen artist for the IN FLUX – Cycle 6 with the City of Tempe, painting a mural on Apache Boulevard. He also teaches children including with Chandler’s Vision Gallery’s VISION KIDZ Programs, Free Arts of Arizona and Childsplay. “I like teaching,” Balcells said. “I like it because one of the reasons I create art is to inspire people. I do it because I like to inspire students, young kids through art. There’s no mistakes in art. He received a bachelor’s degree in graphic design from Universidad del Valle de Atemajac in Guadalajara. Balcells said he takes workshops and classes to keep current with technology. He is happy his work will be featured with Calderon’s at the Chandler exhibit. Calderon, 36, of central Phoenix, was born in Chihuahua City, Chihuahua, Mexico, and raised in El Paso, Texas. She earned a bachelor’s degree of fine arts from Arizona State University and has taken master’s of fine arts level classes in printmaking at the University of Dallas. Like Balcells, Calderon also likes to give back to the community and help children. She has taught at Mesa Arts Center and now teaches art at a south Phoenix charter high school and works as an elective curriculum coordinator for the same charter school system. Calderon recently finished an art residency in Guadalajara. She said the prints she has created for the Chandler Center for the Arts exhibit are a combination of cloth, paper, thread and printmaking. She is also co-coordinating an exhibition called “Migrant Stories: Art Benefit for Kino Border Initiative” on Sept. 20 at The Sagrado, 6437 South Central Ave. in Phoenix. The group show’s aim is to depict migrant stories in a dignified manner, with the goal of raising money for continued care of deported migrants and refugees. The Gallery at the Chandler Center for the Arts is open from 10 a.m. to 5 p.m. Mondays through Fridays and from noon to 5 p.m. Saturdays. Admission is free. Information: chandlercenter.org.